"My attitude on skis is different now. I have learned to put less pressure on myself and on the edges of my skis when I’m racing, to be keep myself more under control." "It’s funny to have become an elegant skier now. But my drive is still the same." "At my age, you need to verify that everything is fine. I put a lot of pressure on my body, and I feel sometimes pain in my back and in my knees, so I have to be sure that I can keep on training hard before going on." "As the time goes by, you change, your learn new things, your attitude is different. 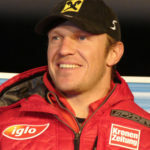 For the moment, I’m still enjoying ski racing so much that it would be difficult for me to think about ending my career."